Click in Windows-8 Fax and Scan New-Scan (... See Image-1 Arrow-2) to scan the documents and click New-Fax (... See Image-1 Arrow-2) to fax the documents. Hot-Tip: ... directly scan documents and save them on your computer directly as a PDF. PS: If you have a scanner, you can use Windows Fax and Scan to scan documents and photos. You’ll have to install your scanner before you can start. Connect it to your PC, plug it in, and turn it on. (Image-1) Open Windows-8 Fax and Scan, to scan and fax the documents! When you use Windows Fax and Scan, your scanned documents and photos get stored in the documents folder under Scanned Documents. If you choose a different scan app, like the one that came with your scanner, that app will probably let you choose a folder for your scanned documents and photos. You can crop an image before you scan it. Just drag the handles of the cropping tool to resize it. For details what your specific scanner can do, check your scanner manual or the manufacturer’s website. If you don’t have a stand-alone fax machine, you can use Windows Fax and Scan to send and receive faxes. You can explore Windows Fax and Scan to find out how to do things like save, forward, and organize your faxes and customize cover letters. Here are a few steps to get you started. With Windows Fax and Scan you can fax electronic copies of your documents and photos. If you have only hard copies, you’ll have to scan them first. For info about scanning, see -Get started with scanning-. Set up your PC to send and receive faxes. Before you can send and receive faxes, you’ll need a fax modem—either internal or external/and an analog phone line. If you’re faxing from a network, you’ll need the address of your fax server. Before you can start the scan, please connect your scanner to your PC, plug it in, and turn it on. And install your scanner driver! Scanners and Cameras in Control Panel enables you to install scanners, digital still cameras, digital video cameras, and other image-capturing devices. After a device is installed, you can use the Scanners and Cameras Wizard to download and save pictures on your computer in a folder you specify. You can also view device properties, delete pictures from your camera, or print photos. You can even test your device to make sure everything is working properly. You can use Scanners and Cameras to link your device to a program on your computer. For example, you can set your computer to automatically open all of your scanned pictures in your program of choice. Windows automatically saves pictures to the My Pictures folder or to a subfolder you specify. If you save your files to any My Pictures subfolder or any folder customized as a pictures folder, Windows provides specialized tools and features you can use such as Windows Picture and Fax Viewer and the ability to view your pictures as a slideshow. Many cameras and scanners are Plug and Play. Windows detects Plug and Play devices after you plug them into your computer. Some devices automatically shut themselves off after a period of time. If your camera is connected to your computer, and it is not being detected, check to see that it is turned on. Windows-8 - FAQ-39: How to open Windows 8.1 Fax and Scan, to scan and fax the documents (access, run, find)? How can i get the fax and scan option that was in windows 7 in windows 8.1? I don't want to scan using my printer i want to scan using my windows 8.1 how can id do that? I need to use my c4480 scanner to save to pdf with windows 8.1? How to transfer a picture from the schanner on 8 window computer? Not needing a fax machine to fax or scan documents in windows 8.1? Enable Windows 8.1 windows fax and scan? Best fax Windows 8.1 apps? I have windows 8 and I am trying to find my documents? Windows 8.1 scan and fax save as pdf? Where are scan documents located in office 2013 with windows 8.1? How to find microsoft scanner in windows 8.1? Microsoft fax scanner windows 8.1? Windows 8.1 scanning, win fax win8? I have windows 8.1 how do i fax a document to an email address? Program on Windows 8.1 for scanning to scan a Windows 8.1 document? Ho to find Win-8 Fax and Scan, to scanning and faxing the documents? Launch windows fax windows 8, how to access microsoft fax and scan in windows 8.1? Free document scanning software for windows 8.1? Windows 8.1 fax and scan? How to open up scanned documents on windows 8.1? Windows 8.1 how do i scan a document? How to obtain a document from a scanner with windows 8.1? Can you get software to run a scanner win 8.1? How to set up sending faxes in windows 8.1? Windows 8.1 will not scan documents as pdf just windows document? Windows fax and scan windows 8.1? How do you scan a document on windows 8 and put it into a pdf file? Windows 8.1 how to find fax and scan? Fax scanner Windows 8.1 and scanning with windows 8.1? How to find installed scanner on windows 8.1? When downloading windows 8.1what is the next step after setting? Best scanning software for windows 8.1? Scan multiple pages to one file using Scan in windows 8.1? How to set a scanner windows 8.1? My windows fax and scan program will not display a preview? How d i configure an account on windows 8 fax and scan? Windows fax and scan why are scanned pages saved as separate files? How to configure windows fax and scan to use pdf? How to use fax/scan on Windows 8.1 when you ARE wireless? How to scan a document in windows 8.1? Change location for scanned photos in windows fax and scan in windows 8.1? How to set up email program for windows 8 for documents? If i scan documents on windows 8.1 how come it doesn't save the rotation? How to download windows fax and scan app for windows 8.1? How do I find docs scaned to usb windows 8.1? How to san in wireless printer and save a scanned file in the computer in Windows 8.1? Win 8.1, have problem scanning, how do i get permission to save to a file? Windows 8.1 fax app, windows fax and scan download for windows 8.1? Scanning and editing with widows 8.1? How to access windows fax and scan in windows 8.1? Windows 8.1 fax and scan download gratis? What program to use to scan a photo in windows 8.1? Windows 8.1 programma per scanning? Windows 8.1 Scanners and Windows 8.1 and fax? How do I scan a document on brother and wondows 8? Does Windows 8.1 have windows fax and scan? How do i setup dektop shortcut to fax and scan in windows 8.1? Is there a built-in fax program with windows 8.1? How to scan a document as a pdf file using window8? Unable to run fax and scanner on windows server 2012? Create windows fax and scan icon on desktop windows 8.1? How do you scan a document in Windows 8.1 where is the start button? How to send a scanned document by e-mail with windows 8.1? How to get to print scan function in win8? How to scan a document to pdf using windows 8.1? I have a scanner that worked with xp, will it work with windows 8.1? Usinging the scan app in 8.1 how do i change the save file to? In Windows 8.1 where is fax and scan software? Where can i find windows fax and scan in Windows 8.1? How to scan documents in to pdf format in windows 8.1? Scan software for windows 8, where do i find scans in windows 8.1? Where is the fax in windows 8.1? How do i scan a document to my computer window 8.1? Windows 8.1 fax or win 8.1 fax software? How to scan something on windows 8, windows fax and scanner for windows 8.1 download? How do you set up windows 8 fax and scan with your hp printer fax? How to find windows fax and scan in windows 8.1? How to set up Windows 8.1 fax and scan? How to scan with windows fax and scan in windows 8.1? Windows 8.1 scannen, Windows 8.1 wo ist fax und scan? Windows fax and scan on windows 8.1? I scanned something and sent it to my computer where will it be on windows 8.1? Install, configure, and send faxes in Windows 8? Software programs window 8.1 scanning documents? How do I scan a document to my computer with windows 8.1? Windows fax and scan for windows 8.1? Faxing with Windows 8.1 basic? Windows user need toactivate scan to computer via printer software. windows 8.1? Email scanned documents with Brother scanner and Windows 8.1? Windows 8.1 fax program, and how to scan to pdf in Windows 8.1? Windows 8.1 and fax and send, windows 8, windows fax and scan? How to use access password in Windows fax application? If you don't have a scanner how do you scan your documents? How can we scan a document to email it using windows 8.1? Using microsoft scan to scan multiple pages in windows 8.1? How do i scan documents in windows 8.1? 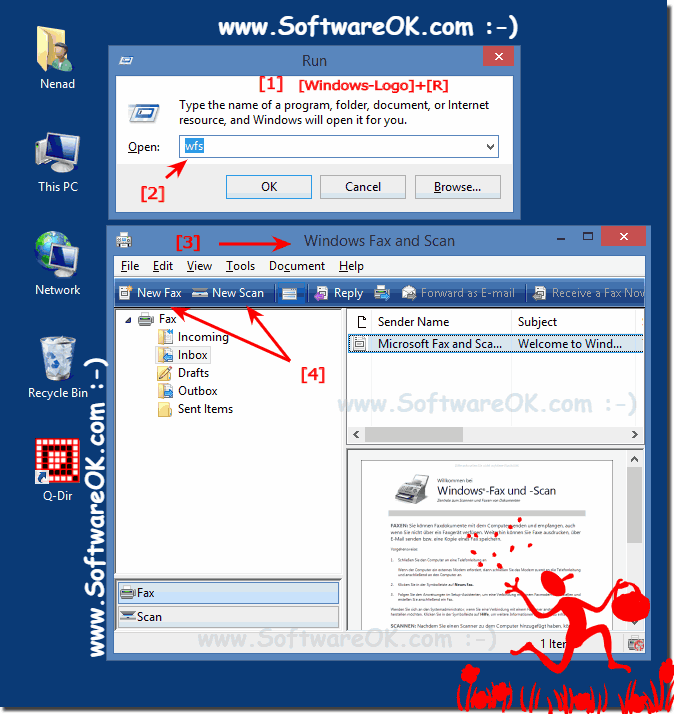 Scanning and file software Windows 8.1 how to scan files in windows 8.1? How to enable scan to computer on windows 8.1? Windows fax and scan available for windows 8.1? How do I scan something into the computer using windows 8.1? Scan document or photo with widows fax andscan window8.1? Where i can find window scanner in window 8.1? Can you use fax and scan with windows 8.1 or how do i scan a document with windows 8.1? Where do i go on my windows 8.1 to scan from my computer? Install windows fax and scan windows 8.1? Does Windows 8.1 have a built in scanner program? Scanning Windows 8.1 and fax in windows 8.1? Win scan to pdf windows 8.1, free image scanning and management software windows 8.1? How to make windows fax and scan scan to a pdf in windows 8.1? Send a fax Windows 8.1 pro, how to fax with windows 8.1? Windows fax and scan could not establish connection windows 8.1? Cannot save file as in windows fax and scan? Where is my scanner on my sansung computer with windows 8.1? Windows 8.1 has disabled my printing of office documents? How do i scan from my printer to my computer windows 8.1? Where do scanned documents go in windows 8.1? How to scan multiple pages into one document in Windows 8.1? Ho to Start Windows-8 Fax and Scan, to scanning and faxing the documents? How to connect scanner to computer on windows 8.1? Where to find scanned pictures in windows 8.1? On Windows 8.1 What do I do to access the scanner? Can I scan as a pdf without using windows 8 fax and scan? Best free fax and scan software download for Windows 8? How does windows fax and scan scan a document to pdf windows 8.1? How to use windows 8 fax and scan? Faxing on windows 8, win8 fax and scan? I can't find my scanned documents on windows 8.1? Fax and scan software and faxes save in pdf format? Does windows have a built in document scanning program to PDF? Where default location scanned document Windows 8? How to scan document on microsoft 2013 in window 8.1? How do i find documents scanned to my computor with windows 8.1? Will windows 8 scan feature allow you to scan multiple page documents? How to scan from printer to computer with windows 8.1? Programa para fax e scanner para windows 8.1? Windows 8.1 fax modem, scan a document win8? How do i scan a document on windows 8 and edited it? How to scan to pdf in windows scan and fax in windows 8.1? How do ,i turn on my windows and scan machine?without a phone line? Printers that scan multiple pages and work with windows 8.1? I have windows 8.1 and windows fax and scan are not installed how do i get it? Using windows 8.1 when 1 use my scanner and open page dot show what i scan? How do i get my scanner to run in windows 8.1? Download windows faxen en scannen? Does Windows 8.1 have fax send and receive? Open Source Image Scanning Software windows 8.1? Windows 8.1 fax and scan file location, app to open scanned document in windows 8.1? I HAVE SCANNED A DOCUMENT IN WINDOWS 8 WINDWS 8! HOW DO I SEND IT BY E MAIL? HOW DO I SET UP WINDOWS FAX AND SCAN ON MY WINDOWS 8 COMPUTER? How to scan a document to your computer from my to computer windows 8.1? Windows8 fax install, Windows 8.1 fax and scan? How to automatically forward scanned documents into folder windows 8.1?